After every major natural catastrophe, particularly one involving flood waters, a slew of damaged cars begin to show up on the used car market. Those cars may have been declared a total loss by insurers and retitled as salvaged or flood-damaged by the state. However, a car may sometimes be moved to another state in a bid to conceal flood damage and sold to an unsuspecting buyer. This practice is known as title washing and can cost you dearly. Many flood-damaged cars look immaculate, with pristine exteriors and clean interiors to show for it. It is not too difficult to make a car look good inside and out, but underneath and within the vehicle’s mechanics, signs of flood damage can be uncovered. Read on to find out ways to check any vehicle for problems. 1. Do your research. Never take the owners word when it comes to the condition of a vehicle. It may look great and run fine, but flood damage problems can appear later on. Rust, mildew and stained carpeting are visible signs of trouble. You will need to dig deeper too, by contacting your state’s Department of Motor Vehicle to learn if the car was branded with flood or salvage titles. You can also purchase a vehicle history report to get some information about the repair history of most any vehicle. (Here is an excellent article that details the limits and sometimes the pitfalls with vehicle history reports — Limitations and Problems with Carfax or any Vehicle History Report). 2. Look around inside. The carpeting may have been replaced and the seats cleaned, but there may be telltale signs that a vehicle was damaged in a flood. Silt, mud and rust may lurk just beneath the surface, or in the back of the glove compartment, at the bottom of the trunk or behind the dashboard. If stains or discoloration are present or the interior colors are mismatched, you are likely looking at a salvaged vehicle. 3. Check the ignition and lights. Get behind the wheel of the car and turn on the ignition. The dashboard should immediately light up, with gauges moving into place and the ABS and airbag lights activated. Operate the turn signals, the emergency flashers, the horn, and get out of the car to inspect the headlamps, parking lights and other lights. Back inside, the climate control system should be functioning turn it on high for both heat and air-conditioning settings sniff the air for signs of mildew. If your car has a navigation system or other electronic components, these should be in working order too. Try each 12-volt connection and USB port. Power windows and door locks should work without a problem. 4. Take it to your mechanic. You will pay to have your trusted mechanic check your vehicle, but it is an investment you cannot afford to avoid. Ask your mechanic to put the vehicle on a lift to inspect its suspension system, brakes, exhaust system, powertrain and other components. If the car has been damaged by a flood, evidence such as mud, silt and rust will appear. High-water marks can be observed on the engine block; wires, as well as other parts, may have rusted. 5. File a complaint. If a car show evidence of flood damage, you should notify your state’s office of the attorney general to make a report. You can also file a complaint with your local Better Business Bureau office. Help other consumers avoid being ripped off by following through with your complaint. 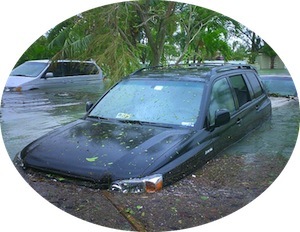 Flood-damaged cars routinely appear on the market after a hurricane or other major weather event. From Texas to the northeast, such vehicles may have been declared a total loss by the tens, if not hundreds of thousands. Even if you do not live anywhere near where a storm occurred, an unscrupulous individual may try to sell a flood-damaged car, costing you thousands of dollars in later repairs when the engine seizes, the transmission fails or the exhaust system rusts through.